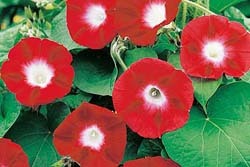 The "Crimson Rambler" variety of Morning Glory is an old time favorite that has become somewhat scarce. These organic, untreated seeds provide a fast-growing climber that is extremely easy to take care of and a colorful addition to any Shaman's Garden. In fact, it's reported that many generations of Aztecs and natives in Mexico (Oaxaca region) believe that a deity lives within the seeds and may have held Morning Glory quite sacred. Today, the "Crimson Rambler" (Ipomoea purpurea) variety of Morning Glory seeds produce stunningly beautiful red to violet flowers with white necks, which typically bloom during the first year as they amaze you at the speed in which they can climb. These untreated morning glory seeds (spraying with chemicals can not only weaken the strain, but it can greatly reduce germination rates as well) are organically grown and harvested. These viable seeds are not for human or animal consumption. They are sold for cultivation purposes only. Cultivation Instructions: After the last frost soak the seeds for several hours before sowing. Plant them 1/4” 1/2” deep, about 15-18 inches apart, keep them in bright light, and keep them well watered. Constantly damp roots produce few flowers, though, so be careful! Grows to a height up to 10 feet. YOU MUST BE AT LEAST 18 TO PURCHASE ANYTHING HERE! YOU AUTOMATICALLY AGREE TO TERMS & CONDITIONS BY ORDERING! WE ACCEPT ECHECKS / BITCOIN / CREDIT CARDS / CASH! DISCLAIMER: The information herein provided throughout this website on various natural botanical products and alternative health principles is for general information only. Please do not use this information to diagnose, treat or cure any illness or health condition. Any health or safety related issues rising due to individual application of our products should be further researched, and the advice of a medical professional requested for allergic reactions to individual ingredients. IAmShaman.com and its owners or employees cannot be held responsible for, and will not be liable for the inaccuracy or application of any information whatsoever herein provided. None of our statements have been evaluated by the FDA.